Combining data from NASA's Chandra X-ray Observatory with radio observations and computer simulations, an international team of scientists has discovered a vast wave of hot gas in the nearby Perseus galaxy cluster. Spanning some 200,000 light-years, the wave is about twice the size of our own Milky Way galaxy. The researchers say the wave formed billions of years ago, after a small galaxy cluster grazed Perseus and caused its vast supply of gas to slosh around an enormous volume of space. "Perseus is one of the most massive nearby clusters and the brightest one in X-rays, so Chandra data provide us with unparalleled detail," said lead scientist Stephen Walker at NASA's Goddard Space Flight Center in Greenbelt, Maryland. "The wave we've identified is associated with the flyby of a smaller cluster, which shows that the merger activity that produced these giant structures is still ongoing. The X-ray image below of the hot gas in the Perseus galaxy cluster was made from 16 days of Chandra observations. Researchers then filtered the data in a way that brightened the contrast of edges in order to make subtle details more obvious. An oval highlights the location of an enormous wave found to be rolling through the gas. Galaxy clusters are the largest structures bound by gravity in the universe today. Some 11 million light-years across and located about 240 million light-years away, the Perseus galaxy cluster is named for its host constellation. Like all galaxy clusters, most of its observable matter takes the form of a pervasive gas averaging tens of millions of degrees, so hot it only glows in X-rays. Chandra observations have revealed a variety of structures in this gas, from vast bubbles blown by the supermassive black hole in the cluster's central galaxy, NGC 1275, to an enigmatic concave feature known as the "bay." The bay's concave shape couldn't have formed through bubbles launched by the black hole. Radio observations using the Karl G. Jansky Very Large Array in central New Mexico show that the bay structure produces no emission, the opposite of what scientists would expect for features associated with black hole activity. In addition, standard models of sloshing gas typically produced structures that arc in the wrong direction. Walker and his colleagues turned to existing Chandra observations of the Perseus cluster to further investigate the bay. They combined a total of 10.4 days of high-resolution data with 5.8 days of wide-field observations at energies between 700 and 7,000 electron volts. For comparison, visible light has energies between about two and three electron volts. The scientists then filtered the Chandra data to highlight the edges of structures and reveal subtle details. 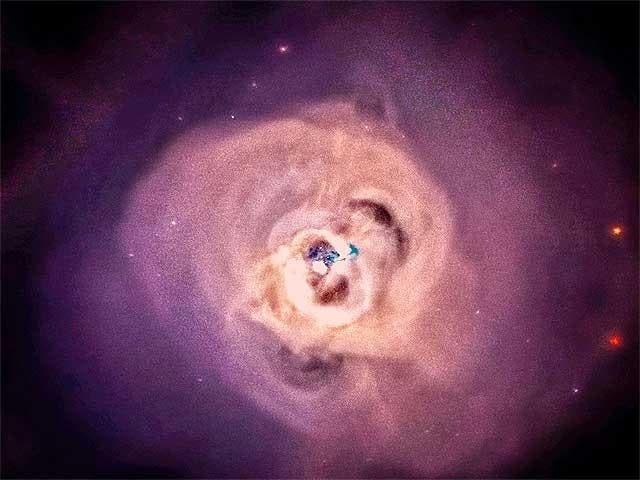 Next, they compared the edge-enhanced Perseus image to computer simulations of merging galaxy clusters developed by John ZuHone, an astrophysicist at the Harvard-Smithsonian Center for Astrophysics in Cambridge, Massachusetts. The simulations were run on the Pleiades supercomputer operated by the NASA Advanced Supercomputing Division at Ames Research Center in Silicon Valley, California. Although he was not involved in this study, ZuHone collected his simulations into an online catalog to aid astronomers studying galaxy clusters. "Galaxy cluster mergers represent the latest stage of structure formation in the cosmos," ZuHone said. "Hydrodynamic simulations of merging clusters allow us to produce features in the hot gas and tune physical parameters, such as the magnetic field. Then we can attempt to match the detailed characteristics of the structures we observe in X-rays." This animation dissolves between two different views of hot gas in the Perseus galaxy cluster. The first is Chandra's best view of hot gas in the central region of the Perseus cluster, where red, green and blue indicate lower-energy. One simulation seemed to explain the formation of the bay. In it, gas in a large cluster similar to Perseus has settled into two components, a "cold" central region with temperatures around 54 million degrees Fahrenheit (30 million Celsius) and a surrounding zone where the gas is three times hotter. Then a small galaxy cluster containing about a thousand times the mass of the Milky Way skirts the larger cluster, missing its center by around 650,000 light-years. The flyby creates a gravitational disturbance that churns up the gas like cream stirred into coffee, creating an expanding spiral of cold gas. After about 2.5 billion years, when the gas has risen nearly 500,000 light-years from the center, vast waves form and roll at its periphery for hundreds of millions of years before dissipating. These waves are giant versions of Kelvin-Helmholtz waves, which show up wherever there's a velocity difference across the interface of two fluids, such as wind blowing over water. They can be found in the ocean, in cloud formations on Earth and other planets, in plasma near Earth, and even on the sun. "We think the bay feature we see in Perseus is part of a Kelvin-Helmholtz wave, perhaps the largest one yet identified, that formed in much the same way as the simulation shows," Walker said. "We have also identified similar features in two other galaxy clusters, Centaurus and Abell 1795." The researchers also found that the size of the waves corresponds to the strength of the cluster's magnetic field. If it's too weak, the waves reach much larger sizes than those observed. If too strong, they don't form at all. This study allowed astronomers to probe the average magnetic field throughout the entire volume of these clusters, a measurement that is impossible to make by any other means. Image Credit: NASA's Goddard Space Flight Center/Stephen Walker et al. Weekend 'Galaxy' Insight — "The Warping of Space and Time"
Strange Rapidly Aging Star Observed –"Never Seen Before in Our Milky Way Galaxy"